In our previous edition of Parenting Decoded, we put together posts about mothers who go to work, come back to manage households and completely rock at it while doing so. In this edition, we compiled posts about those mothers who battle it out from home. Yes! It’s WFH moms we are talking about. Chasing deadlines, attending conference calls and completing work assignments- all of this while being present with your child is no less than a daily battle! 🙂 It may seem like a win-win scenario to have, but is it really so? Let’s hear it from the ladies! A day in the life of a mother is nothing short of chaotic. Debolina Raja Gupta writes about how a regular day in her life is a mad-rush. Filled with multi-tasking, fatigue and shuffling- searching for some ‘me’ time. 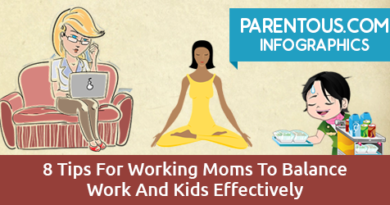 Working from home may seem like a dream come true for a mom who works at an office. But Gauri Kamath tells us why WFH is not so good an option. At home, you have to explain that WFH is not equivalent to vacation and at work, you may be left out from important decisions. Cynthia Rodrigues write about the one time that she did not have any option but to work while being on leave officially. With two hyperactive kids around and a deadline looming over her head, she says the opportunity honed her time management skills really well. As more and more women quit their careers after becoming mothers, there seems to be a trend of starting on your own afterwards. Falak Randerian, a work from home mom herself, asks tough questions about the decision of being a WFH mom. So is it really worth it? Sticking to a schedule becomes really tough when you are working from home says Medha BN. You don’t want family, neighbours and your kids to take you for granted but you want your co-workers and boss to take you seriously at the same time. If you are sitting on the fence about going to work after becoming a mommy or staying back at home, here is a good read by Ronita Maitra. Working mother or house mother, remember you are going to be the best mother. 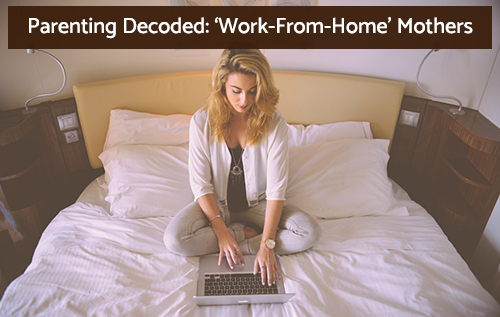 “What is the big deal about working from home? After all you are at home all day!” Do these words sound familiar to you? Social prejudice, time management and self-discipline are some of the challenges work from home mommies face every day, says Puspanjalee Das. Were you able to relate to the instances above? Tell us what you think about working from home while managing children and the house!